Would you take the case? An ethics researcher asks investigators how they would handle a client’s deceptively simple request. On Friday, 20 March, we ran a second ethics case study on the Pursuit Magazine Facebook site. This study involved clients contracting a PI to find a missing daughter and requiring that the PI give them the daughter’s address when she is found. In giving this case study, I was interested in seeing what priority PIs would give to their clients’ wishes. On the surface, the request sounds reasonable, but it doesn’t take too much reflection to see that there might be problems. You are approached by a potential client, a man and his wife in their late forties. They tell you that their daughter has run away from home just before she was about to start college. At 18, she is legally allowed to leave home, but they are concerned that she may have fallen in with a bad crowd. Over the last few years they have been worried that she has been hanging out with friends who they believe to be taking at least soft drugs and possibly worse. They now fear that she may have moved into a squat with “those sort of people.” Ultimately, the couple want the daughter to come home, where they can help her recover from drug addiction and get her back onto track for going to college. However, they accept that you can’t force her to return. 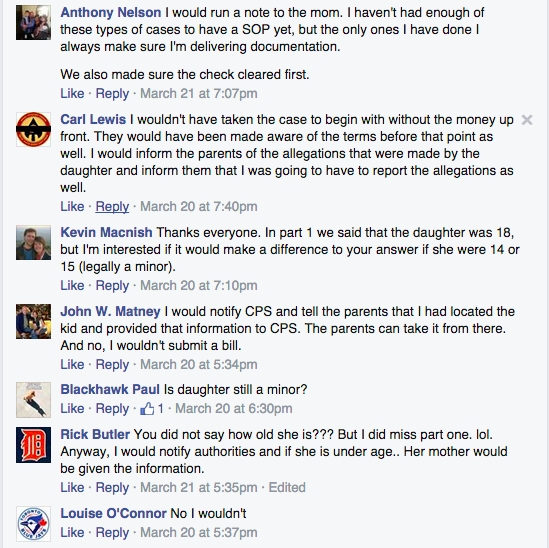 They will instead pay you if you can tell them where their daughter is living. Do you take the case? What considerations would you have? What advice or warnings would you offer the couple? Gina Frenzel and BD Poirier took the lead in the discussion that followed. Gina was the first to respond, recognizing that age is a somewhat arbitrary way of determining whether or not someone is ready for the world. Nonetheless, she noted that she would not reveal the subject’s location but would tell the clients the living circumstances of their daughter. Gina said that she would encourage the daughter to contact the parents and, if not, would try to get the daughter to make a video to give to the parents. This might lead to Gina acting as a go-between to both parties which, she said, can lessen the emotional burden of the case. Admiring Gina’s video idea, BD pointed out that he stipulates in his contracts that locations are never disclosed except under certain, very specific conditions (working for legal counsel, a legal requirement, or, most relevant to this case, the permission of the subject to be located). Carl Lewis then commented that he would act similarly to Gina and BD, and would require written permission from the subject before revealing her location to the clients. Further comments from Jorge Salgado-Reyes and Pursuit’s Hal Humphreys agreed with this approach. When pushed as to whether they would take the case if the clients insisted on the location being revealed, there was a strong sense that people would not. 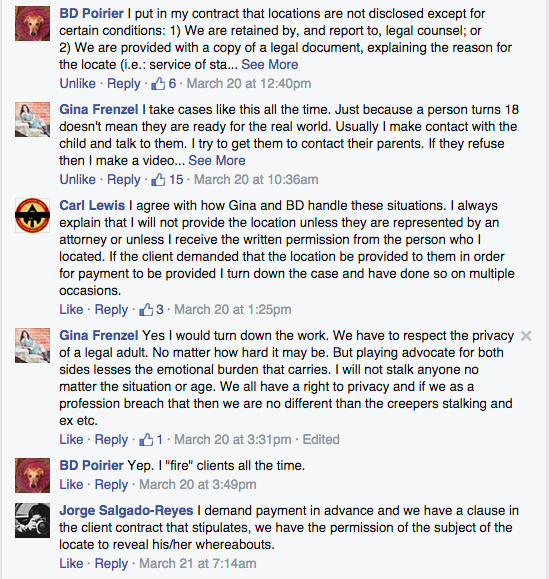 BD talked about “firing” clients, and Gina pointed out that breaching people’s right to privacy renders the PI and the profession as a whole little more than paid stalkers. You take the case. After a couple of weeks, you find the squat where you think the girl is living. Although others at the squat seem to be taking drugs, you see no evidence that the girl is. You try a few times and eventually get to speak to her, to make sure that she is the person you are looking for. During this interview she alleges that she was sexually abused by her father on a number of occasions from the age of 15, and never wants to see him again. She hasn’t told her mother but thinks that never seeing her again is the price she will have to pay. What do you tell the parents? They have said they will only pay you if you give them their daughter’s address. Do you give them the address? As you can see, the responses to Part 1 had largely anticipated the challenges that Part 2 presented and nicely avoided the (perhaps obvious) trap that I was laying! There were more responses to Part 2, although all continued to agree with the earlier comments that the PI should not take the case under these terms. Ari Morse suggested that he deliver a letter to the daughter from the parents, while Steve Morrow thought that a covert photo of the individual which did not identify her surroundings could be helpful in confirming her identity. Several people pointed out that the PI should not be working the case prior to being paid, avoiding a “no trace, no fee” scenario. Several people pointed out that the PI should not be working the case prior to being paid, avoiding a “no trace, no fee” scenario. In receiving payment up front, this would also help clarify the terms of the trace with the clients, so that they were aware that the PI would not reveal the subject’s location without her permission. A number of comments also pointed out that they would inform the authorities as to the allegations, regardless of the wants of parents or daughter. Finally, while I said that the daughter was 18 in Part 1, I was interested in whether her age would make a difference in investigators’ willingness to proceed. John Lilly argued that he would tell the parents (as well as the authorities) if the daughter were a minor. Rick Butler said that he would tell the authorities and the mother. Anthony Nelson would also contact the mother, but noted that he didn’t have a standard operating procedure in these cases yet. Overall, the discussion was good and demonstrated solid reasoning through and anticipation of the ethical concerns. 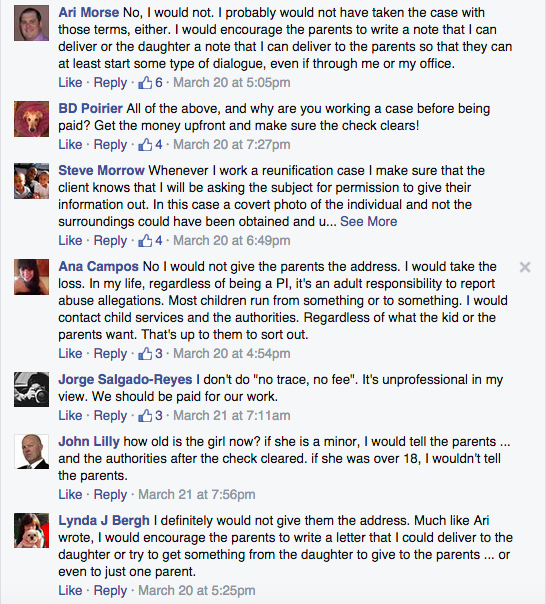 I was encouraged by the resounding agreement that the client should not be told of the daughter’s location. I think that there is some scope for questioning what you should do if the daughter is a minor (or if you have been told by the clients she is 18 but then she tells you that she is 15). 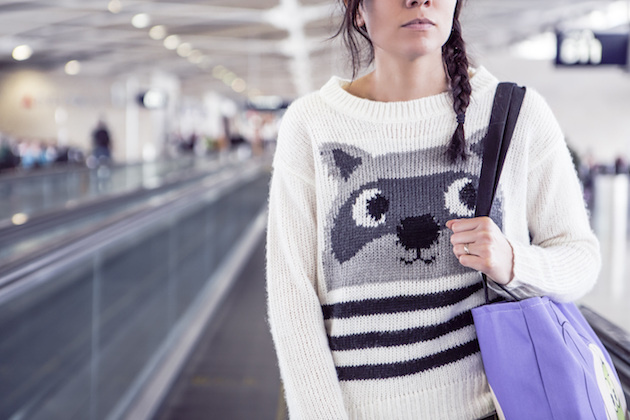 Obviously, no one would want to return her to an abusive situation, although as the case stands you only have her word that the home situation is abusive. The options of passing this onto the authorities, or of offering to act as a go-between, seem like good ways forward here. Thank you to all who participated, and I look forward to the next case study! If you have encountered any ethical challenges that you think would make for good case studies along the lines of the case here, or that you would value discussing, please do email me. See the previous case study in ethics by Dr. Kevin Macnish. 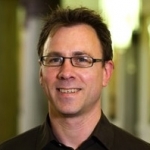 Kevin Macnish, PhD is a teaching fellow and consultant in ethics at the IDEA Centre, University of Leeds. He has written numerous articles on the ethics of surveillance. You can follow him at @KMacnish.